The best Greek islands for wedding! Greek islands with their unique beauty are no doubt the ideal destination for a dream wedding! Which are the best Greek islands for wedding? Find out below! Wedding in the witch Santorini! Santorini is, perhaps, the most famous wedding destination! You will find it, like a noble princess, in the blue waters of the South Aegean, where the sky and the sea become one, enchanting its visitors at the very first glance! The stunning beauty of the natural landscape, white houses with blue shutters, the volcanic rock, the sun that makes the last dive of the day and transforms the unique Oia into a painting, combined with the romantic aura that is diffused on the island, create the most dreamed wedding venue! The options you have for both religious and political wedding are innumerable, and a good wedding planner will help you write your, own, wedding fairy tale! Let Santorini steal your heart! Wedding in the cosmopolitan Mykonos! Located in the heart of Cyclades, one night walk to Matogiannia is enough to make you worship it! Extroverted, festive and beautiful, perfectly balances the traditional element of Greek island’s architecture and the loud rhythms of a modern party, becoming one of the most desirable wedding destinations! In Mykonos you will find everything you have desired: wonderful beaches to enjoy the Greek sun for nine months a year, scenic alleys for romantic walks, shops, bars, fun for every taste! Make your choice amongst countless wedding venues, have your wedding photo shooting in Little Venice, or at the windmills, dive into the blue waters, let the island lead you to a wedding journey that will you never forget! Spetses, wedding in the fragrant island! “L ‘Isola di Spezzia”, meaning the island that smells of its highly aromatic plants, welcomes you to Argosaronikos! Two hours from the port of Piraeus is enough to take you to the small Greek diamond, which offers itself as the ideal wedding destination for you, who are looking for something different! Imposing mansions, graphic carts with horses that refer to all-time seasons, attractions that carry Greek history, but also beaches for every taste, cosmic or … mystical, pine-covered or golden sand, compose the image of a place that honors its past, but lives in the present! Your wedding in Spetses will combine elegance and vintage aesthetics with the classy island style, as well as the sweetness of the famous local almonds, with your loving kisses at the magnificent sunsets of the island! The epitome of finesse and grandeur in its castles and palaces is magically balanced with the simplicity of colorful stretched laundry in the much-singed alleys! Corfu promises to reward you for your choice: if you want a religious wedding, be ready to fall in love again and again with the idyllic landscapes of Panagia Vlacherna in the legendary Pontikonisi and Ypapanti in Kommeno, since both temples are dipped in the sea and bathed by the magnificent sunset of the Ionian! Spectacular green coves and endless sandy beaches are there to offer you an enchanting backdrop for your civil wedding, while the Corfu Town Hall building has for centuries retained the seductive energy of Sian Giacomo Theater, which was originally housed there, and where, for the first time, was performed opera in the Balkan region! The only sure thing is that Corfu, as a wedding destination, will satisfy even the most demanding couples! The white and blue glorification: wedding in Paros! Paros is that Cycladic island that brings to life, in front of your eyes, whatever you have imagined for a wedding destination in Greece! It is located in the heart of the Aegean and could be the ambassador of the island culture, with its music, colors and aromas, but also a wedding venue that expresses a luxurious contemporary lifestyle, in a harmonious coexistence! 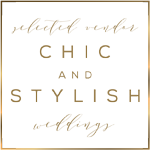 Here, you will swim in splendid waters, walk on golden beaches, let your eyes travel at the most authentic white of the famous Parian marble, taste Greece in small taverns, follow the lyre like another magical lumen, entertain yourself, and live a wedding flavored with basil, and stained by the golden cosmopolitan style of the island! Close your eyes and I will follow… a tender wedding in Sifnos! Let’s start with the practical issues. Sifnos owns 227 temples and monasteries for your wedding so that we can be sure that you will get married! The most photographed point of the island and characterized, by royal decree, as “landscape of infinite beauty”, is the monastery of Panagia Chrisopigi, which chose to be “autonomous” from the rest of the island, leaving a small bridge, only for the bride, to walk to its door! The picturesque villages with the colorful details of the porch windows and the bougainvilleas, give even more value to the white, waiting for you to discover them, and set in the alleys the most sweet and tender wedding setting! Spectacular and minimal wedding in Rhodes! 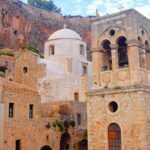 It’s time to get to know the Dodecanese and their esteemed capital! Are you ready to live your wedding in historic intrigue with knights, fairy tales that inhabit the magnificent castle, romantic walks in colorful butterfly veils? Rhodes reserves surprises for you, as long as you have your senses on hand! The Old City is considered to be the best preserved medieval settlement in the world and has been included in the list of UNESCO World Heritage Towns. 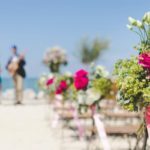 Its countless golden beaches, its splendid villages, high quality services, the abundance of wedding ceremony and party venues options, make the island one of the best wedding destinations! When an island is covered with 80% of forests, it has deep blue waters, paved alleys, 40 small churches only in its city, architecture reminiscent of a painting, by combining several, different rhythms, lacy shores, amazing local flavors and so much else, it will certainly tempt you! If you choose this Sporades island for your wedding, you will live these special days there, as it suits them! The wonderful little church of Ai Giannis in Kastri is one of the most famous wedding spots in the world, as the wedding scene in the musical “Mamma Mia”, with breathtaking views of the sea, was filmed there! Skopelos is a wedding destination that will enchant you with its temperament and will take you along on its magnificent journey! Preview Next post: Plan a beach wedding in Greece!